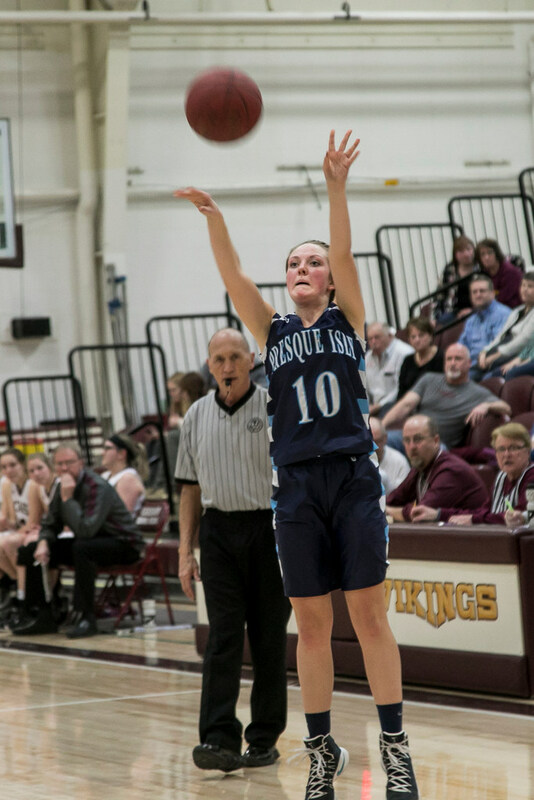 Twelve of Presque Isle’s 17 field goals on Wednesday night were taken from beyond the 3-point line, and that perimeter attack led the Wildcat girls to a 51-35 win over Caribou in the varsity basketball teams’ mutual regular season finale. 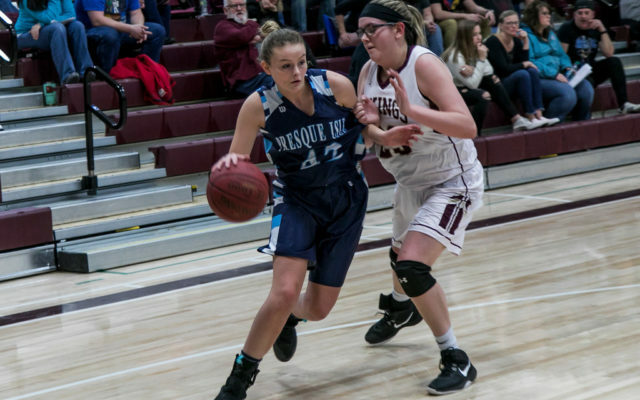 CARIBOU, Maine — Twelve of Presque Isle’s 17 field goals on Wednesday night were taken from beyond the 3-point line, and that perimeter attack led the Wildcat girls to a 51-35 win over Caribou in the varsity basketball teams’ mutual regular season finale. 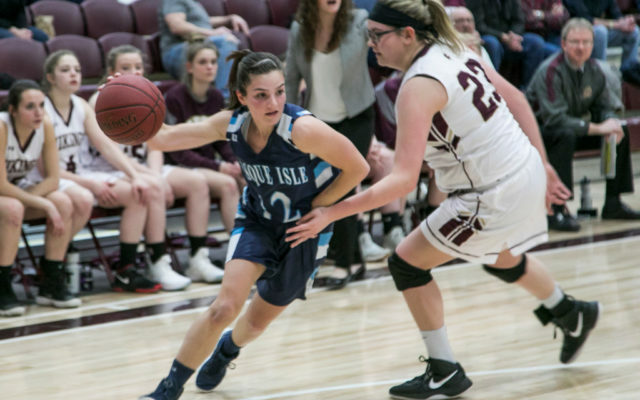 PI, which finished with a 10-8 record and will now prepare to play in a Class B North preliminary playoff game Feb. 12, jumped to a quick 6-0 lead just over a minute into the game on early baskets by Molly Kingsbury, Maggie Castonguay and Madison Michaud. Freshman Faith Sjoberg drained a pair of 3-point field goals for PI later in the first quarter, but Caribou stormed back late in the period, getting six points from Alexis Rodriguez to draw to within two points (14-12) at the quarter break. The Wildcats stretched the lead at halftime as their defense tightened and Alana Legassie, Madison Jandreau and Castonguay all nailed 3-pointers to help make it 27-16. The Vikings cut a 15-point deficit down to five midway through the third quarter, with Kimmy Susi hitting a layup off her own miss and then a 3-pointer on the team’s next offensive trip, but Jandreau found the range for PI by hitting three 3-pointers in the period to help PI go up by nine (39-30) entering the fourth. Presque Isle outscored Caribou by a 12-5 margin in the final quarter and the Wildcats were able to play their reserves the final two minutes. Sjoberg and Jandreau hit four 3-pointers each and Castonguay added three for the winners. Sjoberg led the offense with 16 points, while Jandreau and Castonguay netted 12 each. Castonguay also grabbed eight rebounds. Rodriguez scored 17 points to pace Caribou’s offense, while Susi added eight. 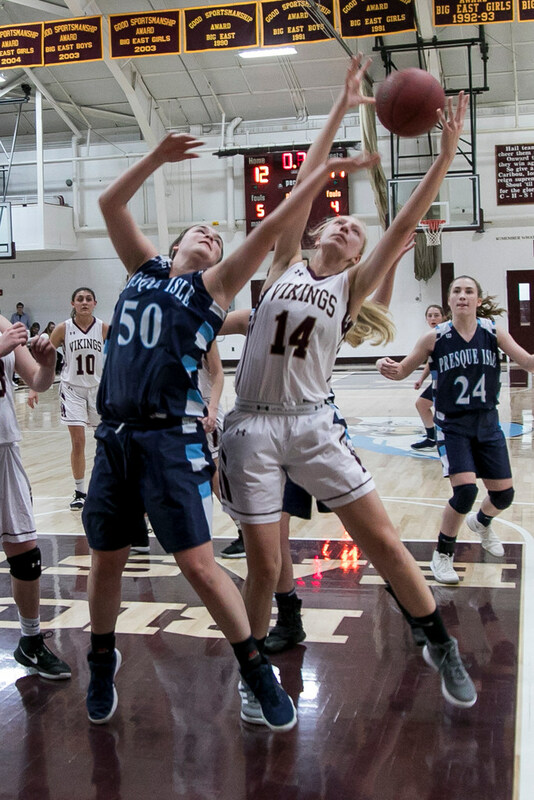 Paige Espling, the 6-1 junior center who played in her sixth game after missing the first 12 while recovering from an ACL injury, turned in a strong rebounding game for the Vikings, They closed out the season with a 3-15 record. Presque Isle coach Jeff Hudson said his team’s intensity increased after the first five minutes of the game, and that was a key to the win. He said Legassie and Rebecca Rider played well in reserve roles and liked his team’s ability to convert shots from the outside throughout the game. Paige Espling (14) of the Caribou Vikings gets ready to grab a rebound as Presque Isle’s Rebecca Rider also goes for the ball during Wednesday’s varsity girls’ basketball game. “We are starting to play more consistently and are looking better offensively,” Hudson added. “I think some of the veterans are starting to realize it is playoff time, and some of the new kids are becoming more confident and doing more things to help the team win. “At this point in the season, it is so important to be team-oriented and play hard for every possession and we hope to do that from here on out,” he added.